“Find a way to love difficult people more, and you’ll be living the life Jesus talked about. Go find someone you’ve been avoiding and give away extravagant love to them. You’ll learn more about God, your neighbor, your enemies, and your faith. Find someone you think is wrong, someone you disagree with, someone who isn’t like you at all, and decide to love that person the way you want Jesus to love you. We need to love everybody, always. I received this book at Together for the Gospel this year, and I think it was a great choice for the young pastors there. We learn so much about studying and delivering the Word at seminary, but I think most guys would say that there is a learning curve when it comes to church administration and pastoral care. Hopefully education on these subjects comes from watching trusted mentors, but I fear more often it’s a trial by fire for young pastors. 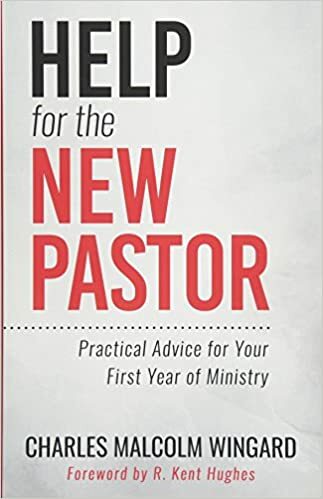 Help for the New Pastor is a great reference tool for young pastors feeling overwhelmed by church leadership and pastoral care. While I have learned a lot about the content of the first six chapters, the rest of the book was full of insights that I had not encountered often. In particular, chapters 9, 10, and 13 were full of wisdom and experience about what to talk about during visits and even what scriptures a pastor might want to read. I’m happy to have this on my shelf, and I will regularly give it as a gift to new pastors. I’m an introvert that loves people. And that often makes working in Christian ministry hard. Minor inconveniences can throw off my emotional cadence, leaving me ready to retreat to quiet and solitude. Jesus takes me to school here in Matthew 14. He hears about the gruesome execution of John – his relative and partner in ministry – at the hands of Herod, and he just wants to get away to be alone to reflect and pray. What a glimpse of Jesus’ humanity. He shows us a very relatable response to grief and loss with his need for solitude and time alone with God. But he’s given little time to himself. His ministry follows him everywhere. As soon as he steps off the boat – there they are. The relatable equivalent would be escaping the office only to run into a crowd of church members at Starbucks. And yet Jesus doesn’t put the boat in reverse when he sees needy people waiting for him. He feels compassion for them and heals their sick. (1) He doesn’t fake his care, but instead musters the proper, righteous emotions for the situation. (2) He acts in these peoples’ lives. He shows that he cares, regardless of their motivations. Brother Pastors, let’s not hide from the mess in front of us. Let’s enter into that mess with Christ-like emotions and care.